Who knew a choir could be this funny? 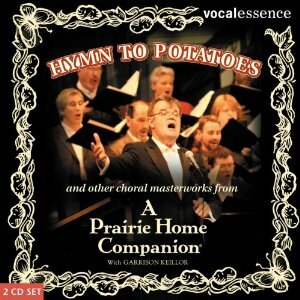 Garrison Keillor, Philip Brunelle and the VocalEssence Ensemble Singers dish up a generous helping of Potatoes a la Schubert, run away to Europe to indulge their “Shenandoah” habit, and enlighten us on the T.U.L.I.P. doctrine. This two-CD set of the best choral skits and bits from 10 years on A Prairie Home Companion includes the often-requested “Julia” (John Lennon) and a rare choral interpretation of “Karma Chamelon” (Boy George). With Charles Kemper and Richard Dworsky at the piano, The Guy’s All-Star Shoe Band and guest appearances by Tom Keith and Tim Russell.